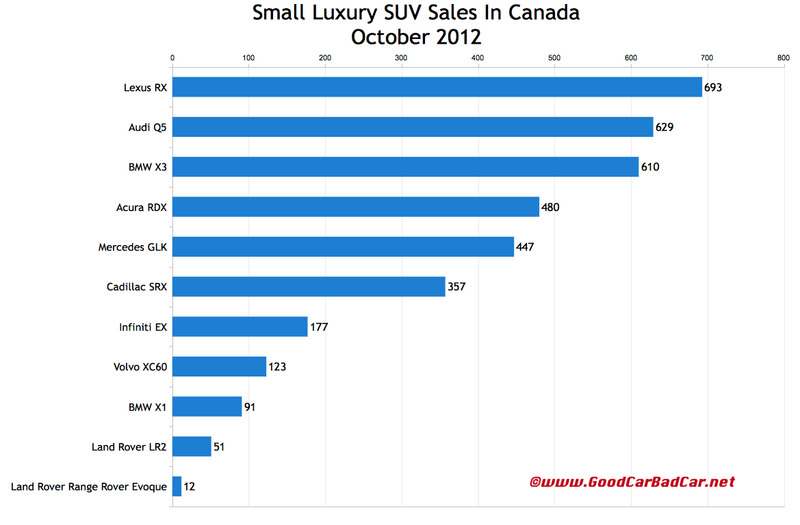 Canada is too small a market to judge low volume luxury SUVs based on a single month’s results. The timing of a Wallenius Wilhelmsen ship’s arrival and the strength of current incentives play as great a role as desirability. BMW X1 sales slid 74%. But keep in mind, the X1 is BMW’s most popular X model. These sharp declines occurred even as Acura RDX sales jumped 46%, 151 units, to 480 October sales. BMW X3 sales rose 50%, 203 units, to 610. And the Audi Q5 recorded a 102% increase, equal to 318 extra sales compared to October of last year. Through the first ten months of 2012, the RDX, Q5, X1, X3, Evoque, RX, and XC60 have all posted notable gains. At Lexus, RX450h sales are up 11% this year and rose 58% in October to 71 units, 10% of the RX’s total. 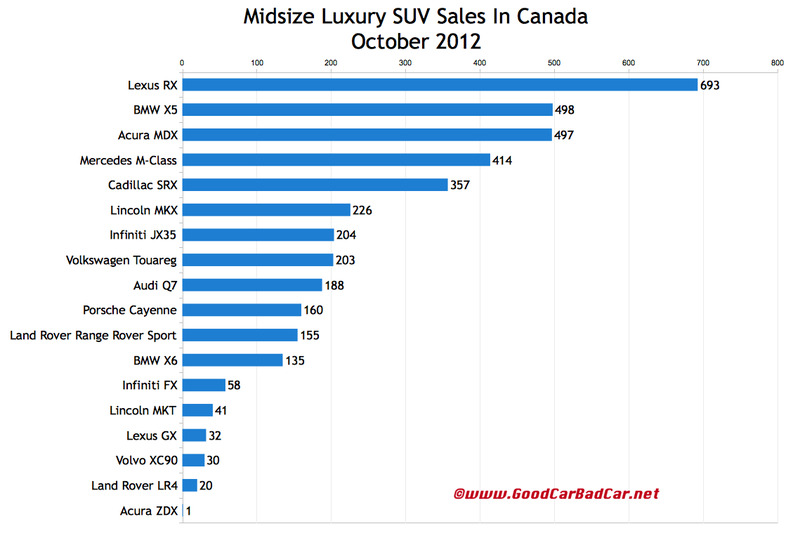 The RX is Lexus’s best-selling model and the 18th-best-selling utility vehicle in Canada in October. The Audi Q5 ranked 20th. By percentage decline, the Land Rover Range Rover Evoque was the second-worst-selling vehicle in Canada. Speaking of increases, among larger and more expensive luxury utility vehicles, the Porsche Cayenne’s 227% year-over-year increase was most impressive. Six out of every ten Porsches sold or leased in Canada in October were Cayennes. Meanwhile, the Cadillac SRX and Infiniti EX – both down in 2012 despite the market’s improvement – posted notable gains in the month of October. Same goes for the much pricier BMW X6. After the jump you’ll find detailed October and year-to-date sales figures for 27 luxury utility vehicles. The two accompanying charts rank these vehicles by October volume; you can click either chart for a larger view. Historic brand and corporate totals (monthly and yearly going back to 2004) are now available through the dropdown menu at GCBC’s Sales Stats page, along with results for more than 260 currently sold vehicles. That’s where you’ll find out that March was the Range Rover Evoque’s best Canadian sales month, but Land Rover USA hasn’t yet been able to match the Evoque’s first month total. If the vehicle you’re looking for isn’t grouped together with these SUVs, it may be listed with luxury cars, with mainstream brand SUVs, or in one of the other segments you can access through the eighth dropdown menu on GCBC’s Tally page. This post was corrected at 3:48 PM AT on 11.15.2013 with updated information from the regarding Land Rover sales.